“Unfortunately, these striking birds are threatened in Guatemala and elsewhere throughout their range. They are sometimes trapped for captivity or killed, but their primary threat is the disappearance of their tropical forest homes. In some areas, most notably Costa Rica’s cloud forests, protected lands preserve habitat for the birds and provide opportunities for ecotourists and eager bird watchers from around the globe. – The quetzal eats wild avocado, and has a symbiotic relationship with the avocado (being the primary animal to distribute its seeds). 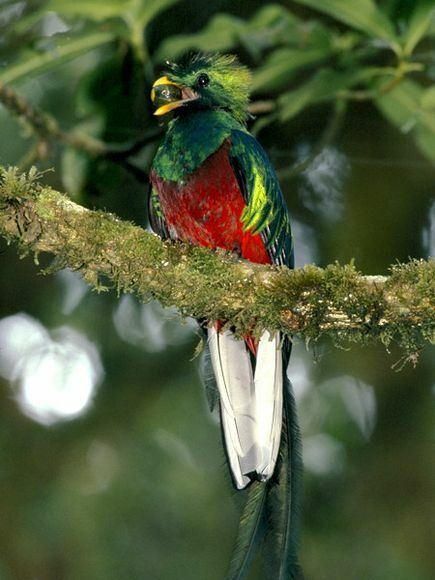 – The quetzal is the equivalent to the N. American bald eagle as a symbol of liberty in South America. This entry was posted on Tuesday, July 26th, 2011 at 11:04 am and is filed under Birds, Media Design. You can follow any responses to this entry through the RSS 2.0 feed. You can leave a response, or trackback from your own site.